Banana oil is made naturally and synthetically. It's a colorless liquid compound formed from isoamyl alcohol and acetic acid. The natural version has a sweet, fruity, fragrance. The synthetic version has a lighter scent. Whether natural or synthetic, it's used various ways. Here, we'll discuss skin care benefits. First, learn all about bananas. 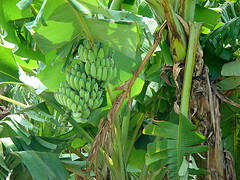 The banana plant is a large flowering plant with spiral leaves. The leaves can tear, easily, in high winds. It's often mistaken for a tree but has no woody parts. It can grow twenty feet tall and thrives in hot climates. Bananas are produced hanging in clusters. Bananas contain natural sugars, fiber, postassium, lutein, carotene, choline, water-soluble and fat-soluble vitamins. Vitamins A, B, C, E and K are all found in bananas, but in varying amounts. Some vitmains have only trace amounts and others higher. Vitamin C is prominent. ACNE: Get rid of blackheads and reduce inflammation. Rub the inside of a banana peel on skin. The anti-bacterial and high potassium content is ideal for treating acne prone skin. The spread of bacteria in skin cells is diminished, allowing pimples or blemishes to heal at a faster rate. You can have acne relief! DRY ITCHY SKIN: Soothing for psoriasis, eczema and poison ivy with anti-inflammatory properties. Bananas support immune system and aids in healing wounds. PRE-MATURE AGED SKIN: Bananas have benefits of vitamin C! Increase skin circulation and boost collagen levels. Vitamin C aids in the production of collagen in skin, cartilage, ligaments and tendons. Fine lines and wrinkles are reduced and prevented to reform. Vitamin B2, (riboflavin), helps liver detox chemicals in the body. Overall, a more youthful, smoother, glowing complexion is revealed. The synthetic version of banana oil is a more affordable for making homemade soap. If you use the natural version in your homemade soap recipes, it will be more costly. A little bit goes a long way, so be sure not to over use. Are you looking for the right soap making oil? Find it now!